NordicTrack SpaceSaver SE9i Review by Industry Experts! The NordicTrack SpaceSaver SE9i Is On Sale! Price Alert: This is $250 OFF the Regular Price! The NordicTrack SpaceSaver SE9i is a rear drive elliptical trainer that is modeled after the award winning design of Precor ellipticals. They purchased the patent rights to produce more reasonably priced models, but the SpaceSaver SE9i still offers the benefit of a very ergonomic design at a value price. In addition, the NordicTrack SpaceSaver SE9i offers some exceptional mechanical features and combines it with interactive technology only available on NordicTrack ellipticals. MID-WEEK SALE ENDS THURSDAY: The NordicTrack SE9i is priced at $1,249 with Free Shipping and a 30-Day Money Back Guarantee. Financing is available. This is $250 OFF the Regular Price! 7″ Smart HD Touchscreen— The SpaceSaver SE9i comes with a a 7” touch screen full color display. You get graphically pleasing feedback with your stats. And the browser fully interacts with iFit Live (See Below). Less moving parts that can cause potential service issues. The rear drive design delivers a more ergonomic elliptical path that closer resembles a natural stride. More stable and solid feel. Power Incline — This feature is found on most elliptical trainers, however, with a rear drive design you tend to maintain a true elliptical motion as it is raised. Most front drive machines warp the motion when the incline is raised. Snap Assembly — Having done our share of assembling fitness equipment, we can attest that it is often a pain and helps if there are two people. The NordicTrack SpaceSaver SE9i requires three simple steps to assemble, which means you are not pulling out your hair trying to figure out the assembly manual and where all the parts go. iFit Live Coach Ready— iFit Live allows your elliptical trainer to communicate with the Internet. Through iFit Live you can create progressive customized workouts with audio coaching, simulate running outside through Google Maps, and track your progress and your stats through your iFit.com account. This technology is only available on NordicTrack and ProForm machines, which are built by the same company. There is an additional cost for this feature. Note: At the time of this posting, this machine includes a FREE 1-year iFit Membership. A great value! 24 Workout Programs — There are 14 cardio burn programs and 10 performance programs, which is a generous selection in comparison to other brands and models of elliptical trainers. Folding Storage — The NordicTrack SpaceSaver SE9i elliptical trainer is designed to fold and stand upright for space saving storage. 18 Lb. Flywheel — The weight of the flywheel will give the NordicTrack SpaceSaver SE9i a smooth motion that will feel like you are running on air. Warranty — The warranty is a bit sub-par for this price range, however, rear drive ellipticals tend to be very low maintenance. 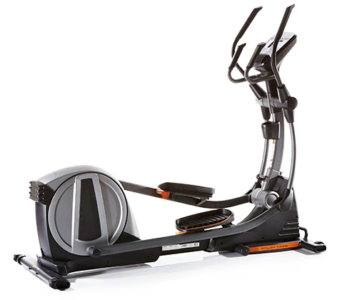 Click here for a comparison chart of NordicTrack Ellipticals. The SpaceSaver SE9i gives you the ergonomics of a Precor elliptical for a fraction of the price. In addition, you are the Android browser and iFit capability, which are only found on Icon Fitness products (Parent company of NordicTrack.). The engineering, design and technology make the SE9i a winning proposition. To save about $800, you may also want to check out the SpaceSaver SE7i model. It only has a 5″ back-lit display and a lower warranty, but that might be worth the price savings for you. Have been using this elliptical consistently for about a week now. Before this I had only used a health club elliptical. It is every bit as good as the one I used in the gym. Very smooth, very quite. I had it assembled in minutes. Also using iFit and have really enjoyed the maps. Have used preset maps and also created my own. I would definitely recommend this elliptical from my experience so far. Go to www.NordicTrackEllipticals.com to learn more! Hi Sheryl, nice to meet you. From what you have described to me, the NordicTrack SpaceSaver SE7i should work well for your needs. If you do not want to deal with assembly, when you “check out” they do offer an assembly option.